We create artworks using adversarial coevolution between a genetic program (hercl) generator and a deep convolutional neural network (LeNet) critic. The resulting artificially intelligent artist, whimsically named Hercule LeNet, aims to produce images of low algorithmic complexity which nevertheless resemble a set of real photographs well enough to fool an adversarially trained deep learning critic modeled on the human visual system. Although it is not exposed to any pre-existing art, or asked to mimic the style of any human artist, nevertheless it discovers for itself many of the stylistic features associated with influential art movements of the 19th and 20th Century. A detailed analysis of its work can help us to better understand the way an artist plays with the human visual system to produce aesthetically appealing images. 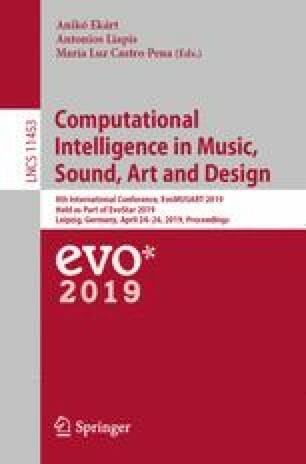 Thanks to Jacob Soderlund, Darwin Vickers and Tanakrit Udomchoksakul for contributing code, and to Jeff Clune, Ken Stanley, Yoshua Bengio, Oliver Bown and Gary Greenfield for fruitful discussions. This research was undertaken with the support of Akin.com, as well as resources from the National Computational Infrastructure (NCI), which is supported by the Australian Government.